Diane von Furstenberg is attributed with saying: “Jewelry is like the perfect spice – it always complements what’s already there.” Some of us would say that’s all well and good, until you have to ask for help in closing a necklace. Maybe you can release the spring, which opens the lobster clasp’s arm, but you can’t hold it long enough to actually close the clasp. Or perhaps your hands just can’t negotiate the T into a toggle clasp’s circle. Whatever your exact manoeuvrability problem, one thing is sure, putting on jewelry can be a frustrating experience. And the frustration seems to increase with age. In The Journals of Gerontology, academics Eli Carmeli, associate professor at Haifa University, the late Hagar Patish and Prof. Raymond Coleman of the Technion state, “Hand function decreases with age in both men and women, especially after the age of 65 years. Deterioration in hand function … is, to a large degree, secondary to age-related degenerative changes in the musculoskeletal, vascular and nervous systems. So what are the different kinds of jewelry clasps or closures and how easy are they to use? Today, eight clasps are usually added to necklaces. The lobster clasp and spring ring clasp have a spring-loaded mechanism. Both operate by fitting one end into the opened spring side, then releasing the spring mechanism to shut. The fishhook clasp is so named because part of the closure resembles the hook used in fishing: one end is a metal hook, while the other is an oval-shaped case. The hook slides into and locks inside the case. Somewhat similar in shape to the fishhook, the S hook works by sliding the S-shaped hook onto a ring at the other end. In a toggle bar clasp, one end is a long bar or T shape and the other is an open shape, usually a circle. The bar slips through the centre of the shape and locks in place. The barrel clasp is so named because, when closed, it looks like a barrel. This clasp consists of two metal pieces, one on each end of the necklace, which close by screwing together. Likewise, in the slide-lock clasp, one tube slides inside the other and locks in place. Finally, both ends of a magnet clasp contain magnets, which attract each another and snap together, locking the piece of jewelry in place. While not always particularly attractive, the newer magnet closures can actually look quite pleasing. While all these clasps are relatively secure, if you have dexterity issues, six of the eight might be difficult to manipulate. So, if you’d like to continue wearing certain pieces of jewelry, to what clasps should you switch? For people with handgrip problems, two necklace closures are usually recommended: the slide-lock and the magnet clasps. 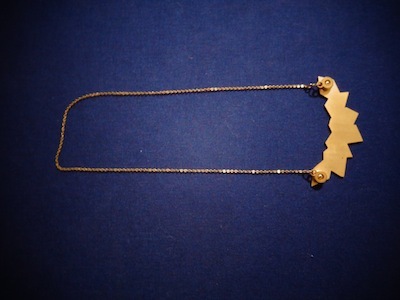 Israeli Keren Doron, who has designed and produced gold necklaces, however, is skeptical about a magnet clasp staying closed when the necklace is really heavy. She also warns that it is possible to damage a necklace when switching its existing clasp. There are many ways to do so, although it depends on the different kinds of jewelry. For example, Doron said not all necklaces with stones can withstand the heat of burner re-soldering. Occupational therapists at Jerusalem’s Shaare Tzedek Hospital suggest that people with dexterity problems switch to necklaces that are long enough to simply slip over the head. If you enjoy wearing costume jewelry, a new Israeli company offers another solution. 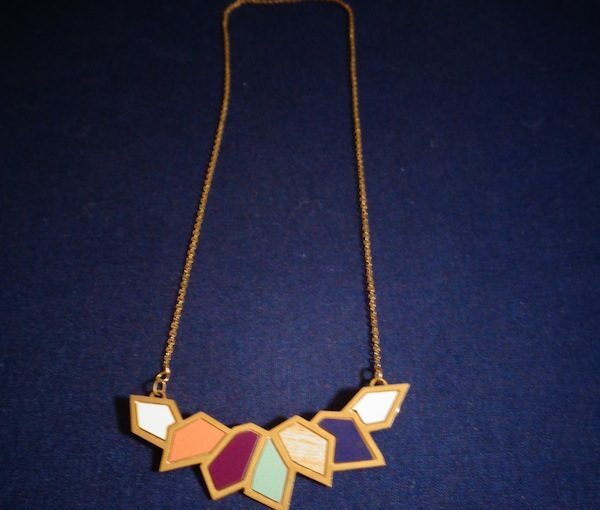 Snaps (snaps.co.il) makes attractive necklaces and earrings that completely do away with clasps. Instead, designers Lilach Bar Noy and Inbar Ariav glue snap fasteners to the back of their pendants (using either a single or double set of snaps) and to each end of the necklace chain. Without having to apply much pressure, the male and female parts of the snap attach. Wearing pierced earrings may also be a problem for people with hand issues. One solution is to wear omega-back earrings with a hinged back that simply flips closed; there are no tiny posts or backs to manipulate. Neta ben Bassatt’s fashion jewelry addresses the problem of closures in a different manner. 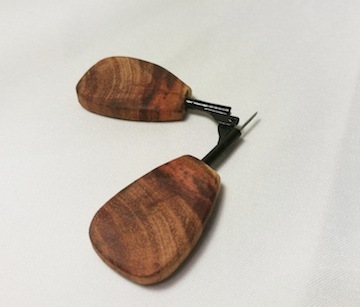 As a student at Bezalel Academy of Arts and Design, she won a prize for her coat pins designed especially for people who have visual impairments. Her wood and brass pins may be used with heavier clothes, such as cotton, wool, linen, etc. Two of her pins have a kind of clasp that can fasten best to a shirt collar or the lapel of a suit, where it is easier to get to the other side of the fabric. Her other designs feature a long, open needle pin, which can be attached anywhere on the fabric. Importantly, the wearer does not need to touch the pin itself, thus eliminating the chance of sticking oneself. Is jewelry important? The answer depends on whom you ask. One thing is clear: jewelry has been around a long time. As early as Chapter 24 of the Book of Genesis, Abraham’s chief servant (Eliezer) is giving jewelry to Rebecca’s family. And, with people living longer, more and more adaptability and accessibility issues will arise, so we are likely to be talking about jewelry for a long time to come. Deborah Rubin Fields is an Israel-based features writer. She is also the author of Take a Peek Inside: A Child’s Guide to Radiology Exams, published in English, Hebrew and Arabic.